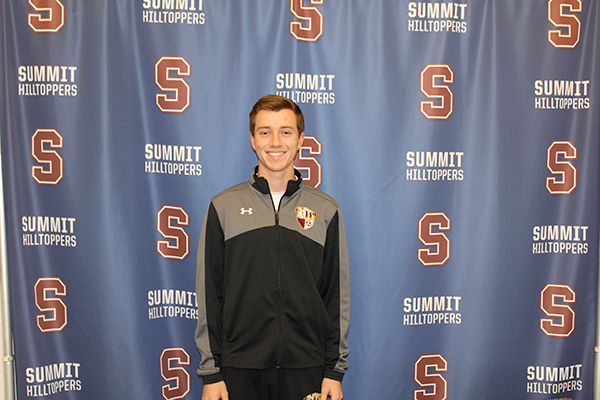 Matt Kohaut is a senior at Summit High School. He is a three-season athlete who began playing soccer in his sophomore year and enjoys the competitive aspect to it. Matt’s position is defense. He explained that there is a special dynamic to the team, one of camaraderie and fellowship. “Before each game we get amped-up, have fun, and prepare to get things done,” said Matt. He attributes a lot of his success to the strong coaching he has gotten from Ashley Sularz, Christopher O’Brien, Matt Schachtel, and Kevin Zaleski. Additionally, Matt has been involved in Track since freshman year thanks to his sisters who drew his interest towards it. He runs the 110-400 hurdles and is a sprinter as well. He appreciates how the team is like a family. They work together and train together. Everyone at each meet cheers each other on. Matt expressed his gratitude for his coaches: Adam Fern, Alexandra Kelly, Antonio Martins, and Neal Sharma. For the second year, Matt is part of the Peer Leadership program. He loves how it unites a lot of different people, all with varied interests, who have a common focus on honing their leadership skills. This fall, Matt and about 40 peer leaders attended a retreat. He shared one activity that stood out. “There was a 10 foot wall and we had to get everyone over it. Seeing the process, the thought, and the teamwork was amazing!” During the course of the year, peer leaders interact with students in all grade levels, as well as with the Summit community. For example, they deliver lessons to elementary school students and participate in the Toys for Tots Drive with the Summit Police Department. They also participate in freshman deliveries; during study hall they talk to freshmen, about different clubs, encourage them to get involved, and give advice on how to navigate the high school experience successfully. “These are beneficial Q&A sessions where I am glad to offer support to others,” said Matt. Academically, Matt is a student who gravitates towards math and science, with his favorite class being Computer Science. “My coursework and classes have always been rigorous, which I know will help me in the future.” Matt’s number one goal for the future is the Naval Academy. He has been interested to serve in the military like members of his family. In addition to the military, others in his large family have careers in service, such as fire and law enforcement. Along his high school journey, Matt has gotten a lot of helpful advice including the importance of getting involved in school and creating a support network. He values the friendships and connections he has made at Summit High School. Matt’s advice to others would be to stay motivated, set goals, and remember that the effort will be worth it! With that attitude and his go-getter spirit, we know he will go far!